This activity has been designed to meet the educational needs of primary care physicians, internists, hospitalists, physician assistants, and other allied HCPs interested and actively engaged in the management of patients with hypertension. For nearly half a century, beta-blockers (BBs) have been a pivotal mainstay in the management of hypertension. Yet, there is still some confusion as to the differences among the agents, the data supporting their use, and patient selection. BBs are not a homogenous class of drugs, and many of the therapeutic limitations prompting guideline changes may not be present in third-generation agents. Unlike earlier BBs, select third-generation BBs exert direct vasodilatory effects by improving endothelial function and mediating the release of nitric oxide, a potent vasodilator. Data suggest that newer agents are not associated with many of the common side effects of early-generation BBs, and that they may have a particular role among difficult-to-treat patient populations. Questions regarding their efficacy and tolerability have raised concerns about how best to use BBs, ie, which to prescribe and for what patient type. 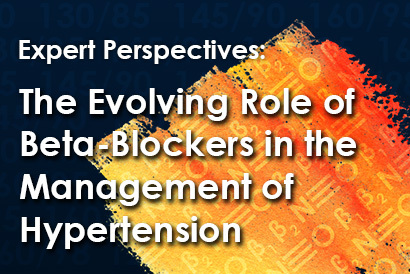 To address these concerns, The Evolving Role of Beta-Blockers in the Management of Hypertension—Expert Perspectives has been developed for primary care physicians. The purpose of this webinar is to examine the utility of BBs in the management of hypertension through a review of contemporary, evidence-based data on their use as an essential tool in the clinician’s fight to appropriately treat patients diagnosed with hypertension. The focus is on the contemporary role of BBs in the management of hypertension, differences among the various agents, and patient selection criteria—which agents to choose and for whom—in a lively roundtable discussion among the experts. Describe differences among first-, second-, and third-generation beta-blockers and, particularly, the differences between older agents and new vasodilating third-generation agents. Review meta-analyses and clinical trials informing current guideline recommendations to determine if and when beta-blockers should be used for the management of patients with hypertension. Describe the mechanisms of action and clinical data demonstrating efficacy and safety of newer beta-blockers for consideration in the treatment of patients with hypertension. Hypertension in the US: Is There Still a Role for Beta-Blockers? Consulting Fees: Daiichi Sankyo, Inc.; Forest Laboratories, Inc.; Takeda Pharmaceutical Company Ltd. Speakers Bureau: AstraZeneca Pharmaceuticals; Takeda Pharmaceutical Company Ltd. Consulting Fees:AstraZeneca Pharmaceuticals; Boehringer Ingelheim Pharmaceuticals, Inc.; Novartis Corporation; Takeda Pharmaceutical Company Ltd. Speakers Bureau: Daiichi Sankyo, Inc. Consulting Fees: Abbott Laboratories; Daiichi Sankyo, Inc.; Ipca Laboratories Ltd.; Medtronic, Inc.; Novartis Corporation; Pfizer Inc.; Laboratoires Servier; Takeda Pharmaceutical Company Ltd.
Speakers’ Bureau: Daiichi Sankyo, Inc.; Forest Laboratories, Inc.; Takeda Pharmaceutical Company Ltd.
For PDF viewing, Adobe Acrobat Reader is recommended—download at http://get.adobe.com/reader. Technical Support: If you have any technical problems or playback issues, please click on the Technical Support button on the left of the screen or call contactus@paradigmmc.com. ©2014 Paradigm Medical Communications, LLC, except where noted. This web presentation may not be reproduced in whole or part without the express written permission of Paradigm Medical Communications, LLC. To earn CME credits using the website, the submission of certain personally identifiable information is necessary. The required items include: first name, last name, degree, and email address. These items are necessary to award and track the credits and participants may earn after completing the program. Participants are required to complete an evaluation of the CME activity. All evaluative information submitted is collected and retained, and assists the staff of Paradigm Medical Communications, LLC in continuously improving the learning experience. If you have any questions or comments regarding this policy, please send an email to contactus@paradigmmc.com.